Before he retired, when watching the hurling or football on the box I'd always turn down the television volume and put the radio on instead. 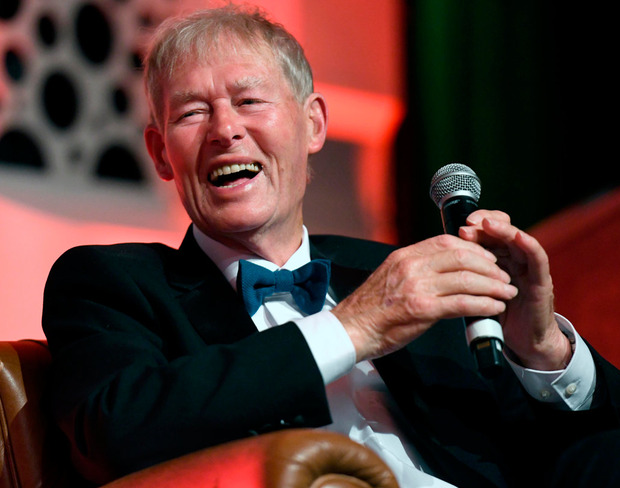 Just to listen to the great Mícheál Ó Muircheartaigh, who remains peerless in his analysis, wit, knowledge and commentary. Mícheál had seen it all in hurling when a Rabbitte chased a Fox around Croke Park, and having analysed thousands of markets down through the years for the 'Betting Ring' column, I sometimes feel as if I've seen it all in racing. I've seen 1/100 shots beaten in-running, 999/1 horses win, and all the highs and lows one can imagine in the betting world. But when I read this week that quite a few bookmakers have made Tiger Roll as short as 7/2 for the Aintree Grand National, which takes place in a fortnight, I realised that there's always room for another surprise. The layers are not known for their generosity, but I think you'd want your head examined to back a horse at 7/2 for the world's greatest steeplechase. Don't get me wrong, I love the animal - and one of my biggest bets at Cheltenham, alongside the ill-fated Sir Erec, was on him to win the Cross Country Chase. Like all racing fans, I'd be delighted to see any horse emulate the great Red Rum and win back-to-back Nationals. This little horse is a joy to watch, and he lit up the Cross Country at the Festival, a race not loved by all. He certainly deserves to be favourite, and with the handicapper putting him up 8lbs after Cheltenham, he might not be too bad at the weights after all when compared to last year. But any time I hear a bookmaker telling us they are running for cover, I get a little suspicious. I know bookmakers have to cut prices if they rack up very large liabilities on a certain horse, but their PR departments are also masters at concocting stories about massive gambles. If they were to be believed, there's a 'gamble of the century' happening about once a month. Most of them are foiled, of course. Again, I'd love to see him successful, and he 100pc deserves to be favourite, but backing a 7/2 shot in the Grand National is not my idea of fun. I've said it before and I'll say it again, ante-post betting is just not what it used to be and even before he won at Cheltenham, he was already as short as 8/1 in places. While he may well win, and it could be argued that a 7/2 winner is better than a 100/1 loser, I still won't feel I've egg on my face if he's successful as I'm purely complaining about the price, not his ability. Should he win at those odds, he'd be the shortest Grand National winner ever. Let's see what happens over the next couple of weeks, and hopefully some bookmakers grow a pair and offer a decent bit of value on Gordon Elliott's nine-year-old. Speaking of favourites, the jolly has a decent record in the Grade Two EBF & TBA Mares' 'National Hunt' Novices' Hurdle Series Final at Newbury (3.15). Since the turn of the century, there's been five winning clear favourites from 18 races, producing a profit of over 4pts if blindly backed. Ten were placed, some at each-way prices, and The White Mouse is sure to be popular in the betting at odds of 7/2 or thereabouts. She won her latest race at Doncaster fair and square, but I don't think we learned a huge amount from that contest where she faced just two other opponents. Her jumping wasn't great and although she's a promising mare, this could be tough with a rating of 125 which leaves her 2lbs off the top-weight Annie Mc, which carries 11st 10lbs. With a rating of 119 and odds of 9/2, Nicky Henderson's She Mite Bite is preferred. Second of nine on her handicap debut off 116 at Sandown in February, she was brought down when running very well off today's rating in a handicap at Ludlow - and while the six-year-old is yet to win in five races, she's gone close and it's only a matter of time. On the Polytrack at Lingfield, consider backing Metatron, which is decent value around 3/1 for the Ladbrokes Home Of The Odds Boost Novice Stakes (2.35). He got his career off to the best possible start with a victory in a novice at Wolverhampton as a two-year-old in October, and his subsequent defeat at the same venue in November is overlooked as he had a 7lb penalty to contend with. While he'll carry more than each of his seven rivals again today bar Fields Of Athenry, from what we've seen so far both of those have a bit in hand over the rest, and it would be no surprise to see them battle out the finish. Fields Of Athenry comes here with a very similar profile, winning his debut and subsequently losing under a penalty.